One of the most interesting aspects of being a Financial Planner is the very uniqueness of every Client relationship. Even in my given niche - Senior Military Members near or into retirement - there is a very high degree of variability amongst individuals. Some are married, some are single, and others are divorced. Inheritances, savings habits, and spending habits have left no two individuals - whose military earnings are nearly identical - in the same financial spot. Whatever the case, the documents behind the initial conversation bring exactness to the generalities typically touched on during introductory meetings. For Resilient Asset Management, we have collated a list of desired documents in order to formulate the building blocks of a cogent Financial Plan for our Clients. In addition to the security provided through this mechanism, this process also enables robust, customizable information sharing between the Firm and the Client, which is so essential in crafting Client Financial Plans. If a Client does not presently have Estate Documents in force, we of course recommend retaining the services of a qualified Estate Attorney to work with the Client to execute the above documents. This is not an exhaustive list. The point here is to have a second set of eyes review your Estate Documents for adequacy, completeness, and accuracy. Then, to do a review each year to ensure the plan is still relevant and to update when necessary. Indeed, updating a plan is far less cumbersome than starting from scratch - a point about which any Joint Staff Planning Officer is keenly aware. Risk Management is a tremendous service to Clients. 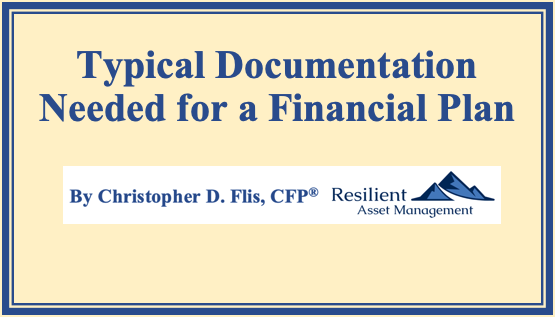 The aforementioned set of documents can assist your Financial Planner in crafting recommendations to hopefully avert financial catastrophes. Individual and corporate tax payers can procrastinate about a great many things. They can also estimate, contemplate, project and what have you. However, with Income Taxes, we are required to "settle up" with Uncle Sam every year down to the exact dollar. Overlooked Sales Tax Deduction in Income Tax Free State Residents. With the Tax Cuts and Jobs Act of 2017, the Income Tax code and forms have changed significantly, so it is even more critical to provide your returns to your Financial Planner for review and comment. Some prospective Clients and others seeking financial services have a paradigm of only Investment Management when it comes to seeking Financial Advice. Simply put, they are looking for their parents' "Guy" of yesteryear. As Financial Services have evolved, so too have individual Financial Planners. Now, "Holistic", "Comprehensive", and "All Aspect" are all the rage amongst a new breed of Financial Planners looking to provide "Fee for Service" advice to their Clients. Despite the changing nature of Financial Services, there is still much value for Financial Planners to deliver to Clients via general investment advice. To provide meaningful advice, a Financial Planner needs all your data. The importance of supplying all the data to your Financial Planner cannot be overstated. This is not the area where you want to omit the "secret" credit card account carrying a 5-figure balance! Rather, this is the time to allow all the accounts to see the light of day so your Financial Planner can assist with pointing you down the road of financial prosperity. The documents listed above are collectively a staggering set of data. However, supplying this information to your Financial Planner will enable him/her to organize your Financial Picture in a cogent way. Furthermore, once your Financial Planner couples this data with the qualitative data you provide through several Client Meetings, he/she will ideally be able to provide you the necessary recommendations to reach your financial goals.